"John Whitaker was interested in Christopher Dodson bus bodies built for operators outside London and I mentioned that Tilling had purchased 30 Dodson-bodied AEC Regents for their Brighton operation. I’ve now found out that they were identical to the 191 AEC Regents they operated in South London, some with Tilling and some with Dodson bodies. In London, they were in the range ST837-1027. 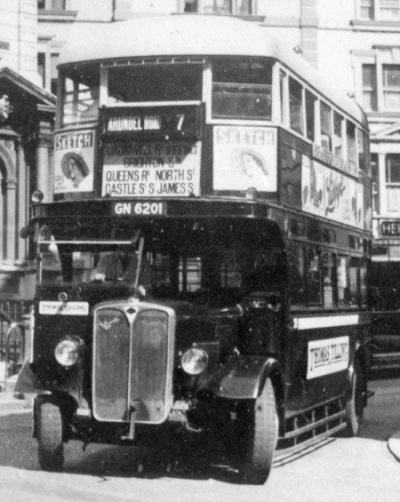 I attach a photo of the sole remaining example (ST 922 – GJ 2098), albeit it a London example, although Tilling’s livery was not that different from this example. To me, It looks odd because I only recall them with terrible body sag and this one doesn’t have it, having being completely restored! Once in London Transport’s hands, they were greatly unloved, but that’s another story!" Many thanks Chris for the marvellous photo of GJ 2098. The 30 Tilling STs bodied by Dodson were built to Tilling design. Dodson design bodies were common in the "Pirate" fleets, and some Provincial municipal fleets too, notably Wolverhampton. The latter had many 6 wheel interpretations on Guy chassis and are worthy of an article in themselves! Many of these Tilling STs were transferred to other Tilling fleets during the war, and many were rebodied and/or re-engined. Of particular interest to me are the 3 vehicles lent to BCPT (Bradford) to enable the Stanningley tram route to be abandoned in 1942. These were GJ 2027, 2055, and GK 6242. These were accompanied by some Leeds "Regents" and 3 "General" STs. Pity I cannot remember them, but I was only 2! The body sag you refer to seems apparent on every photo I have seen, but they did "soldier on" in trying conditions. 3 more vehicles of this species are also close to my heart in the form of York-West Yorkshire ADG 1-3, which started life in the form depicted in your superb photograph. Incidentally, Wolverhampton 6 wheelers can be seen in the You Tube reference you gave on the recent post concerning the "White Heather" coach! I’m sure that I’ve read somewhere that, of the later STL-type Tilling Regents which went to London Transport, still with three bay upstairs front windows, but inside staircases, a batch also also went to Brighton. Both deliveries had Tilling bodies, though. The above ST sub-class were due for withdrawal on the cusp of the war. They were all withdrawn by LT, along with all other petrol-engined vehicles, when war broke out. Several suffered from war damage and their chassis went to the Home Guard, either as armoured personnel carriers, others as complete vehicles, to become (Home) guard posts. Then they were spread around England/Wales to fill shortages. For example, ST844 spent time in Coventry, Walsall & Rhondda. ST851 went to Sunderland, then Bradford & Aberdare. The longest one away was ST1005, which left for Venture, Basingstoke in December 1941, not returning until January 1947. On return, it went into store for a few months, then was scrapped, a typical end for returnees. I’ve always had a soft spot for them, loyal, uncomplaining servants, past their sell-by date in 1939 and kept away from the limelight thereafter! Amazingly, some lasted until late 1949, nevertheless. They were strangers to Morden, Surrey, where I lived, but I can recall travelling on a couple of stalwarts seeing out their final, challenging, stint on the Epsom Races specials. I was a mere stripling aged 11, bunking off from school! I only ever saw one ST, and it was 922, mouldering in Rush Green Motors’ scrapyard somewhere out in the bundu between Hertford and Ware in 1952. Its roof gave it away over the dense scrub which rimmed the yard, for it could be just glimpsed from the top deck of a London Country RT. I made entry to the secure yard, somehow having persuaded the ruffians in their Nissen hut that I meant them no harm, (though I was quite tall for a nine-year old, and could have bruised their shins if it turned nasty). As I recall, the breakers had used ST 922 as a canteen. Its L.H. dumb-iron brass plate identified it as the very bus which Prince Marshall was to restore years later and put in to limited service in London. I kept a light bulb from its upper saloon for many years as a memento of that rare bus, the bulb, alas, now lost due to postwar parental determination to periodically cleanse bedrooms. There was a pre-war Leyland ‘decker there, too, ex-Chesterfield Corporation, from which I took a fine iron enamelled plate mounted forward of the driver, which admonished him to ‘Pull into the Curb at Stops’. I was even then taken by the cacography. In his obedience, our luckless chauffeur might have ‘Curbed his enthusiasm at stops’, or even ‘Stopped up on to the Kerb’….. I wonder if his traffic manager was reduced to the ranks for a fine Solecism or merely scolded for Malapropism? But I digress. The info relating to the pilfering has been concealed until today, lest it had led to a period of infant incarceration, still then common, but I surmise that the Statute of Limitations now applies – and for that matter, all the other characters of the piece must now rejoice at The Great Terminus, their days of pointless litigation at an end. Post-war, BH&D modernised them, which included changing the three-window arrangement to the conventional two-window type. In my original comment, I mentioned that 30 of this type, with Dodson bodies, served in Brighton. Here is a photo of one. It is unusual in showing the upstairs air vent, normally unseen in photos. 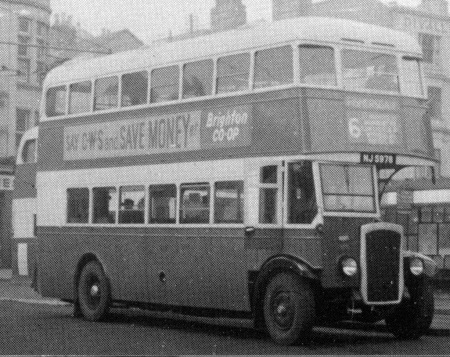 Several of these Brighton STs were later rebodied and eventually converted to open toppers. At least half a dozen later migrated to Westcliff (for the Southend seafront services) and Eastern National (for the Clacton services). I understand one eventually finished up as a tree lopper for Eastern National. Hi Chris.. Compliments on your photograph of 6201 and also your knowledge. Thx, Sid, glad you enjoyed the posting. From September of 1951 to July of 1955 I commuted to school from Mill Hill to Kilburn. This was in the days of the trolley buses at least as far as Cricklewood Broadway. I cannot give the date but on the route 16 a green ST class bus suddenly appeared. It stayed around for a few weeks and then vanished again. Similarly on the route 79a a green STL appeared again for a short period. I don’t think either of the two buses made it to preservation but if anyone out there can confirm my sightings I would be very interested. The route 16 at the time was the preserve of the SRT Class and the 79a was all RTs. There were plenty of Country Area green STL’s, both with front and rear entrances, and, by the period you mention, Ron, post-war RT’s were rendering plenty of the older vehicles spare. The last only went in 1955. The green ST is a mystery, since very few were ever painted green and spent their lives at Watford Garage. They were all disposed of by no later that 1950. 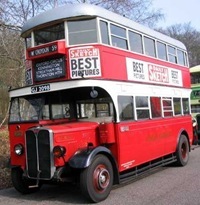 However, LT was always short of lowbridge buses then and kept its lowbridge 1930 ST’s going until 1953, both at Watford and Godstone Garages, Some found their way to Morden at times, to keep the 127 red route going. It’s possible that it was one of them found its way around your way to fill a gap or be a learner in its final months. I believe that they were unique with LT in having a sunken gangway each side upstairs. Each one was also visually unique, having been ‘played about with’ in different ways at various overhauls! I have very happy memories indeed of a roundtrip on GJ 2098 when it was operating a vintage service starting in Trafalgar Square. I seem to recall that it was pretty spritely and comfortable – the seat cushions gave the impression of being a foot thick and were luxurious, and they seemed to accentuate delightfully the "up and down" movement of the suspension. the driver also handled the old bus very competently indeed – a very happy hour or so to recall. Was the upholstery a sort of grey with black swirls on. I seem to recall that that was the LGOC colour scheme (if you can call grey a colour!). Or maybe it was the standard LT stripe patterning. The SRT class was an unequivocal disaster, comprising pre-war STLs expensively modified to accept heavier RT type bodywork for which RT chassis were still awaited. 300 were planned, but the nonsense finished after 160 had been constructed. With the 7.7 engine and vacuum brakes the SRT wouldn’t go and, more critically, it wouldn’t stop. The first of the class entered service in April 1949, and by mid 1954, the utter folly of the programme having finally been accepted, they were gone, apart from a handful retained as Chiswick toys. Perhaps the fleeting appearance of ST and STL vehicles was dictated by SRT mechanical failures. Chris H – Yes, I’m sure that you’re right about the seating upholstery, and that’s exactly the colour scheme I remember. Roger – As a "distant" ardent admirer of the seemingly excellent "SRT" conversions I’m surprised to hear that they were as disastrous as seems widely claimed, although I have read of this elsewhere too. I thought that the plan was an ingenious one and sensible too but of course I had no experience of driving them and only a limited number of rides. I must say though that I’m amazed that their speed and more importantly presumably acceleration were so poor, but only to be expected by comparison with the magnificent 9.6 litre RTs. Braking, well the vast difference between vacuum brakes and air is no secret, and different driving techniques and "expectations" are essential. I would imagine though that some kind of semi rural and light operation would have found them quite satisfactory. From an enthusiast point of view though their acoustics were a delight and the different "era" instantly apparent – and the fascinating combination of older machinery with the beautiful RT bodies made the SRTs for me a very memorable version. Chris, as you indicate, the theory behind the SRT class appeared, on the surface, to make sense, as RT type bodywork deliveries were outstripping RT/RTL chassis supplies. Although the life extended elderly pre war fleets of ST and LT machines were largely gone by 1948, LT wanted to clear out the utilities and remaining STLs as quickly as possible to project the high quality, post war LTE image to the capital’s travelling public. The SRT seemed to meet the bill. It looked the part, and the ordinary traveller surely wouldn’t suspect that the mechanical bits under the new, modern bodywork belonged to an earlier engineering era and were upwards of ten years old. Sadly, converting STL chassis to take the half ton heavier RT body proved to be far more complicated, and hence much more costly, than anticipated. The chassis had to be remodelled quite considerably, and major components, such as the fuel tank, had to be re-sited. The result was a bus that looked very good, but performed very poorly, particularly in the braking department. The AEC 7.7 was a perfectly sound engine, but it didn’t have the decisive low speed torque of the comparable 7 litre Gardner 5LW which was still the favoured power plant for many new Bristols in the Tilling companies’ fleets. I should think that the less than lively performance could have been tolerated; the real difficulty lay with the brakes, which proved barely adequate on downhill gradients when an SRT was well loaded. There must have been rather more to the braking problem than simply the vacuum system. We have both driven heavy, vacuum braked double deckers around the Yorkshire gradients without too many frights. The Halifax Daimler CVL6/Roe ‘deckers were pretty heavy beasts, 8 tons unladen, but they stopped equally as efficiently as the air braked PD3s – as you know, the hills round Halifax make most of urban London look like a billiard table. I can only assume, since I can’t find any figures to support this, that the lining areas of the old STL brakes were rather smaller than those of post war double deckers generally. In the event, the SRTs were taken off routes that included any suggestion of a slope and relegated to flat territory. The word got around, and the Country department apparently refused to have any involvement with the things. In the meantime, RT and RTL chassis production came on stream, and the SRT class quickly surrendered its RT bodywork to new chassis and the STL underparts to the scrapyard. Your comment about bus acoustics resonates, I’m sure, with many members of OBP. As a child up to the age of four I delighted in the contrasting sounds emitted by LT, STL and RT types in Selsdon and Croydon, and, from that age onwards, having by then moved to rural Kent, I became captivated by the marvellous melody emitted by the Maidstone and District Leyland TS8 Tigers as they climbed Chequers Hill out of Doddington. By contrast, the petrol Tigers running along the valley just purred along. In Faversham, one could find East Kent Dennis Lancets (pre war, four cylinder jobs I later discovered) with smooth running, drumming sound engines. From 1949, by now an eight year old resident in Alverstoke near Gosport, I couldn’t initially understand why the Provincial AEC Regents sounded so dramatically different from their London cousins, and became a fan instead of the stuttering new Guy Arabs on the Haslar route. Only later did I discover that these fine buses had peculiar five cylinder engines. I am rambling on a bit now. I’d better stop. There was another part of the jigsaw to add to Roger’s tale and which makes the STL/SRT saga slightly more logical. LT’s 1935-40 New Works Plan exceeded the legal limit that AEC/Chiswick could legally order/produce and so outside suppliers were used . A good example was the 100 all-Leyland STD class; pseudo-STL’s. 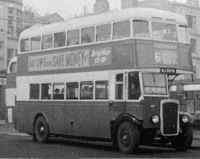 Another case was 175 STL chassis, but with Park Royal metal-framed bodies, which were already failing in 1942, when the worst bodies were scrapped and replaced by new lowbridge STL bodies under special dispensation. The rest were all but held together with strapping, post-war, and the idea was that the 15STL16 1939 STL’s would have their bodies transferred to replace the PRV bodies and be re-bodied with the RT ones. The 1939 STL’s should have been RT’s, but production was not ready in time. Nevertheless, many RT features were incorporated into these chassis, including automatic chassis lubrication, but, crucially, not the 9.6 litre engine, not quite ready for service. Thus, of the 132 of STL’s finest, very few survived in their original form and they, if memory serves, were Country Area vehicles, no doubt held onto for dear life! Please Roger, don’t even think of pleading "rambling on" – that post was full of absorbing and informed comment and opinion and is fascinating to read. So, in summary and the famous hindsight, it seems that the SRT scheme was a brave and expectedly fraught. venture which ought to have succeeded but was beset with undeserved problems and expense. You are quite right about the mountains of West Yorkshire and the greater area and I suppose we drivers thought little of nothing of such terrain as most of the elderly and basic vehicles of the time did their commendable best. The only real braking worries with the old vacuum system that I recall were occasionally with certain Leyland PD2s (but not PD1s) of both 7’6" and 8’00" girth – and even, with later employers, air braked PD3s, but that’s obviously another discussion altogether. I hope my memory and imagination aren’t running riot, but I’m sure I recall that when the 34 RTs arrived at Samuel Ledgard and were being prepared for service there was an issue with the brake drums/shoes. Was it the case that the RTs, as opposed to Mark 3 Regents in general, had more robust brakes – hence the London drivers’ meaningful objection to the SRTs. I believe that Ledgard fitters mentioned to me that the drums (front at least) were of a slightly larger diameter than standard and that "shims" (possibly hardwood ??) had to be inserted between the new linings and the shoes to give satisfactory results. This was of course fifty two years ago and if I’m way off the mark I’ll gladly blush and hide for as long as necessary. During the mid to late 1940s the 77A route, which I took from Wimbledon to Wimbledon Park (to school) or to Wimbledon Chase (to visit my grandmother) had several "odd" buses. As kids, we were thrilled when the occasional coach came along as this seemed to us to be travelling in luxury. However, the most exciting was when our bus had a staircase that was outside the bus. As young boys we, of course, always rode upstairs. Which reminds me – the conductors often referred to the upstairs as "outside". I only remember being on an outside stair bus on two or three occasions, probably in 1948, 49 or possibly 1950. Referring to David’s mention of "outside", conductors in Ashton under Lyne and Manchester guards up until the late 1960s used to have phrases such as "on top" and "inside" when designating the upper and lower decks.